It is best not to let dogs “play” with coyotes. At Bernal Heights (a neighborhood in San Francisco) about 9 years ago there was a single little male coyote who had chosen ONE of the dogs to frolic with: the coyote and the dog learned to know what to expect from each other and they acted accordingly. This was a lone coyote — a youngster who craved company and would allow himself several minutes of such play every day before disappearing into the bushes. This behavior became a daily occurrence over several weeks. The activity was considered “sweet” and “benign” by some of the onlookers. But, in fact, it broke down barriers that serve to protect both wildlife and dogs. Dogs and coyotes almost universally do not like each other. This is because of territorial concerns. Coyotes do not allow non-family coyotes into their territories except for passing-through. In the recent videos I saw of dog/coyote interactions at Pine Lake, there was chasing of a coyote by a dog and then vice-versa. The dog owner should not allow his/her dog to chase coyotes. This might not be play. The coyotes were assessing what the dog could do by playing a game of oneupmanship which, at this point, seemed, indeed, to border on play. The coyotes were also assessing where in their hierarchy the dog might fit. But the apparent “play” could quickly deteriorate into a situation which could be dangerous not only for the dog involved, but for the other dogs who are around, AND for the coyote. The coyote’s instinct is to protect itself and not let other animals in too close to itself. A larger dog could easily maim a coyote — they do it all the time where there is coyote penning — and a small dog can easily be given the same treatment as any other animal of prey — no different from the way a coyote would treat a skunk or squirrel or juvenile raccoon. And the coyote could message the dog with a nip to the haunches to get it to leave it alone, as seen in the photos here. 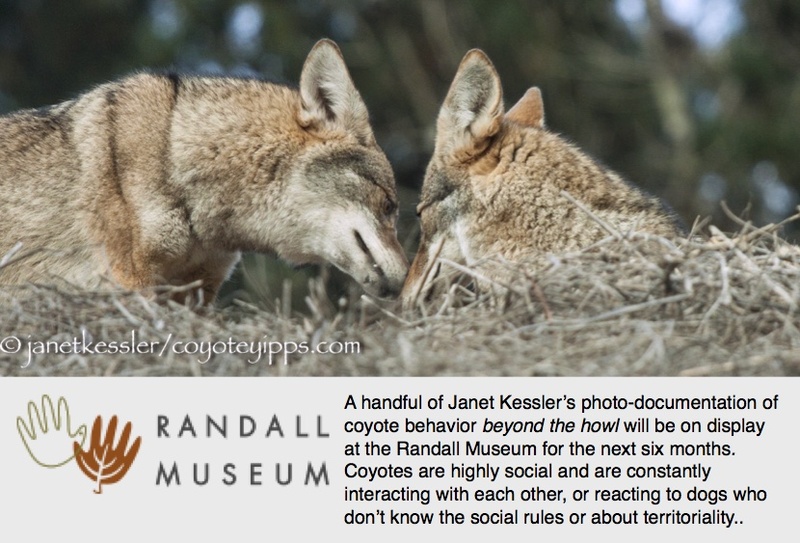 In addition, once a coyote becomes accustomed to intermingling with dogs — and therefore people — you are setting up a situation that has the potential for the coyote to approach people. In fact, coyotes and dogs have bitten people trying to break up a fight between the two. Once a coyote has bitten a person, his fate is the death chamber. Here, again, there is a problem, because it’s hard to find the “right” coyote who has done the biting, so often, a number of coyotes will be eliminated to insure that “the culprit” is caught. But of course, it wasn’t the coyote’s fault, it was the human’s fault who allowed a situation to occur in the first place. So, please keep your dogs leashed if they like going after coyotes. It is the dog owner’s responsibility to do so. If a coyote approaches dogs, it is the responsibility of the dog owners to create distance by leashing and walking away, and to shoo it off if it continues approaching. Please watch the demonstration of how to do this on the YouTube video, “Coyotes As Neighbors”: https://youtu.be/euG7R11aXq0.